How do you know about JSRS? I have fully read and understood the Terms and Conditions. I am authorized by my Company to agree and abide by the Terms and Conditions. On submittal of Registration, you will receive an order confirmation mail to the company email address provided. Please confirm acceptance of that mail for further processing. The Login credentials to JSRS will be sent to your registered company email address on receipt of order confirmation. 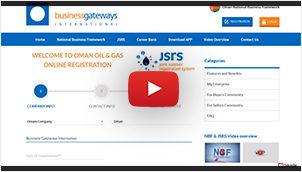 Tier 1 - Integration to the Oman National Business Framework (NBF). Tier 2 - Validation of documentation pertaining to JSRS, both Oil & Gas Industry and Buyers Community (all other industries). 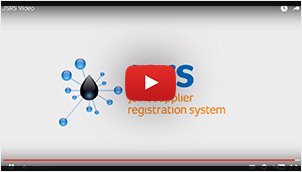 JSRS Certificate will be issued after successful completion of Tier 2 validation process. The Validation and Payment process shall be advised by phone / email. Integration to Oman's National Business Framework (NBF) does not automatically qualify the Supplier to JSRS and is further subject to the detailed Validation process of Suppliers as per Ministry of Oil & Gas Oman's standards. The Subscription Fee paid is inclusive of NBF and JSRS access and is non-refundable for any reason whatsoever.